Secretary of State Rex Tillerson (L) and Egyptian Foreign Minister, Sameh Shoukry hold a press conference after their meeting, at Tahrir Palace, in Cairo, Egypt, Feb. 12, 2018. U.S. Secretary of State Rex Tillerson warned Tuesday of the need to remain focused on an "enduring defeat" of the Islamic State group, even though the militants have largely been ousted from the areas the once controlled in Iraq and Syria. Tillerson spoke at a conference in Kuwait for members of the coalition the United States set up in late 2014 with a multi-prong strategy of countering Islamic State, including through U.S.-led airstrikes and working to cut off the group's financing and flow of foreign fighters. "ISIS remains a serious threat to the stability of the region, our homelands and other parts of the globe," he said, using an acronym for the group. Tillerson said the militants are no longer in control of 98 percent of the territory they held at their height in 2014 when they declared the establishment of a caliphate in Iraq and Syria, but that they now pose a different threat. "In Iraq and Syria, ISIS is attempting to morph into an insurgency. In places like Afghanistan, the Philippines, Libya, West Africa and others it is trying to carve out and secure safe havens," he said. 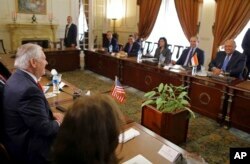 U.S. Secretary of State Rex Tillerson (L) meets Egyptian Foreign Minister Sameh Shoukry (R) and their delegations, in Cairo, Egypt, Feb. 12, 2018. Tillerson announced $200 million in new aid to liberated areas of Syria. Later Tuesday, he is taking part in a donor conference aimed at rebuilding areas of Iraq. Ahead of the meeting, a senior State Department official said "the eyes have to be on the prize" when describing the need to focus on defeating Islamic State, and highlighted recent conflicts in the Afrin area of northern Syria between Turkish forces and the U.S.-backed Syrian Democratic Forces as a distraction from that goal. The official, and Tillerson in his Tuesday comments, recognized Turkey's concerns about Kurdish militants it considers a threat. "We believe there’s a way to work through, walk through, these problems, and that’s why the secretary is going to Ankara, to have those discussions," the official told reporters. Tillerson is on a five-nation trip in the region, which began in Egypt and includes stops in Turkey, Jordan and Lebanon.